There's nothing like a thick, juicy steak -- except when you're on a diet. Steaks have long been a dieting no-no, as they tend to be high in both calories and fat. Most diets recommend that you limit your meat intake to "lean protein," and recommend skinless chicken breast and poached fish. What's a carnivore to do? Luckily, there is a Steak Lover's Diet that seems to be pretty effective at promoting weight loss. "The Steak Lover's Diet" is the title of a book published by Dr. Melvin Anchell in 1998, although similar diets prescribing red meat, limited amounts of fruit and vegetables, and, in some cases, certain types of alcoholic beverages, have been around for about 150 years. A Dr. Harvey first prescribed such a diet in 1862, and it once again became popular nearly a century later when Dr. Alfred Pennington published his DuPont diet in 1951. Steak and eggs crash diets became popular in the 1970s, but low-carb diets really came into their own in the 1990s, beginning with the publication of Dr. Atkins' "New Diet Revolution" in 1992. On the steak lover's diet, you may consume two or three meals, at which you're allowed all the meat you like, as long as it doesn't contain any "hidden carbs" such as dextrose, meat extenders, filler, etc. You may also eat one of the following per meal: one medium-sized potato, sweet potato, banana or pear; one half grapefruit, one medium slice of watermelon -- about one inch thick -- or 3/4 cup of blueberries; raspberries, grapes or cooked rice. Spices and carb-free condiments such as mustard and hot sauce are okay, as is butter, oil and even mayonnaise, as long as it contains no sugar. Beverage choices are limited to unsweetened black coffee and plain tea and water -- no artificially-sweetened drinks allowed. The steak lover's diet does permit the consumption of limited amounts of certain types of alcoholic beverages. Dr. Anchell does not give strict limits to the amount of alcohol that is to be consumed, nor does he recommend its consumption as a necessary part of the diet. He merely cautions that those dieters accustomed to consuming alcohol and unwilling to give it up entirely will need to avoid certain types of alcoholic beverages. Basically, any type of beverage containing sugar is out, so you may not drink wines, liqueurs, beer and most types of mixed drinks. Whiskey, vodka, gin, scotch and bourbon may be consumed straight up, on the rocks or mixed with club soda or water, and martinis are acceptable as long as you don't eat the olive. Dieters on the steak lover's regime report that they feel satisfied, and do not suffer from the hunger pangs and cravings common to many other types of diets. The fact that this diet does allow certain fruits and vegetables to be consumed makes it less restrictive and monotonous than a strict no-carb approach, and many dieters appreciate the fact that they can still relax with a drink at the end of a day. This diet usually results in a weight loss of around eight pounds per month. Dr. Melvin Anchell actually has a background in medical psychoanalysis instead of nutrition or bariatrics -- also known as the treatment of obesity -- and he does not adequately explain just why the particular foods his diet recommends work. He is very emphatic that his diet must be adhered to strictly, but cannot tell why, for example, strawberries are forbidden but raspberries are okay. Another drawback to this diet is that it can be quite expensive to follow. Meat is seldom inexpensive, and cheaper protein substitutes like eggs, peanut butter and beans are forbidden. 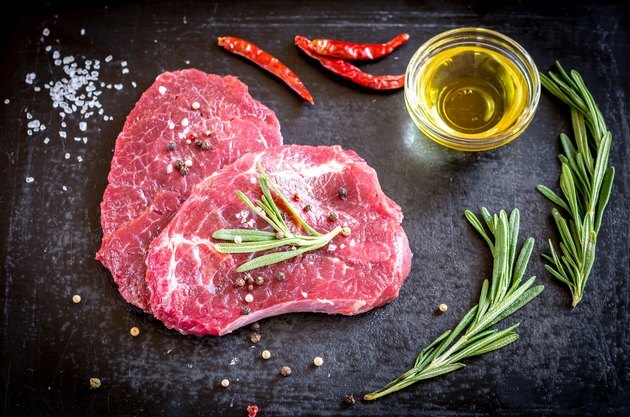 LowCarber.org: The Steak Lovers' Diet, Melvin Anchell, M.D. How I Lost 36,000 Pounds, Melvin Anchell, M.D.